Here's how to find each object: In the northern hemisphere, the planets will be in approximately the locations seen in the chart above, about one hour before sunrise. Start looking about 75 to 90 minutes before sunrise, to give yourself time to find and identify the brighter ones. Observe from a location that has a low, flat horizon to the southeast. 1) Locate Venus towards the southeast. Other than the Moon (and later, Sun) it will be the brightest object that direction. 2) Locate Jupiter towards the southwest. It is the next brightest object in the night sky after Venus, so it will be easy to identify. 3) Draw a long line from Jupiter to Venus. Between that line are two stars, and two planets of about equal brighteness (dimmer than Venus and Jupiter). 4) Using the chart at bottom, estimate 30 degrees from Jupiter to find the star Spica. 5) From Spica, estimate 20 degrees to Mars. 6) From Mars, estimate ~ 25 degrees to both Antares, and Saturn. The color of Antares is close to that of Mars. Saturn is cream or white. 7) Venus is easy to find; continue a line from Saturn through Venus to find Mercury, about 5 to 7 degrees away, towards where the Sun will be rising. 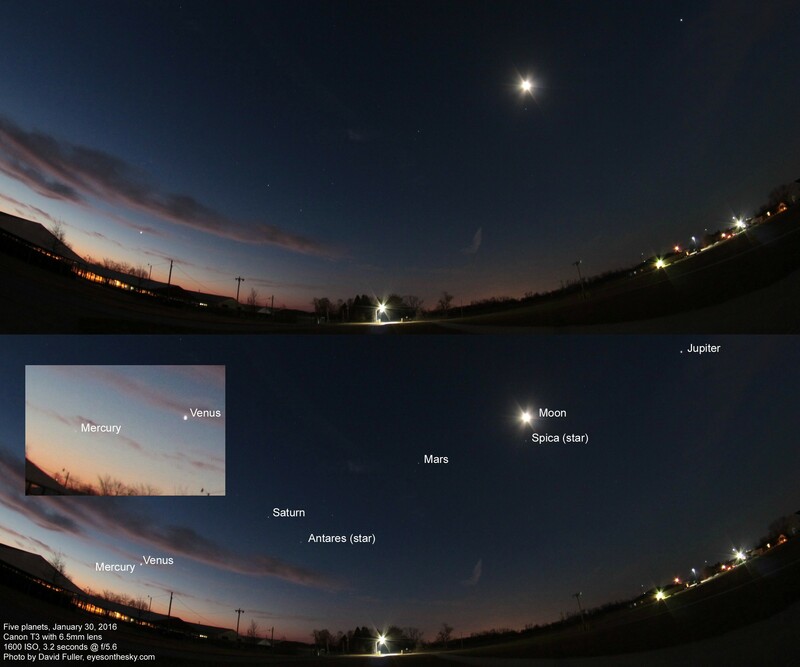 Note about Mercury: It tends to be best seen right about an hour before sunrise. This is because it is about 5 degrees above (a flat!) horizon, and early enough that twilight glow is still minimal. It can be seen before then, but it is lower. It can be seen after then, but twilight increases and makes it harder to see with passing time. 8) Bonus! Look down and you've got 6 planets (Earth). That's 3/4 of the planets in the solar system!